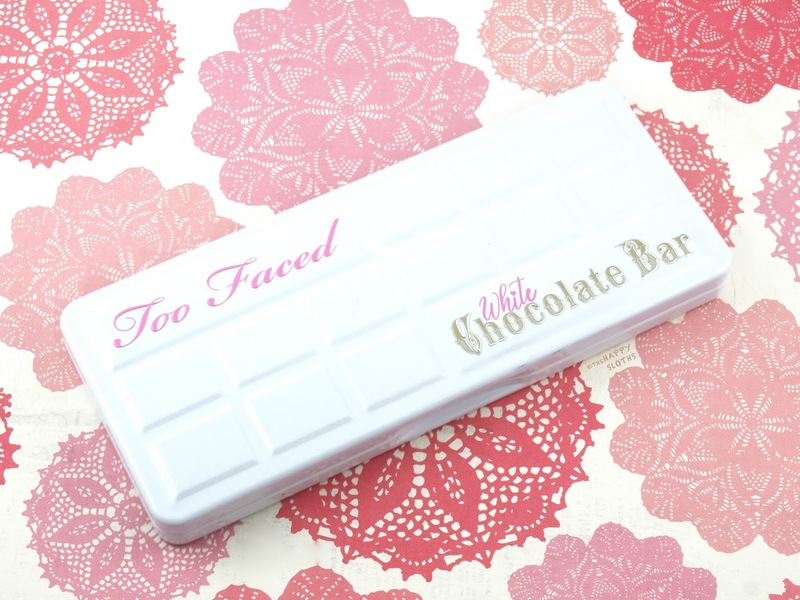 The Too Faced White Chocolate Bar Eyeshadow Palette comes in a white metal tin, very similar in style to that of the original Chocolate Bar palette and the Chocolate Bon Bon palette (reviewed here). 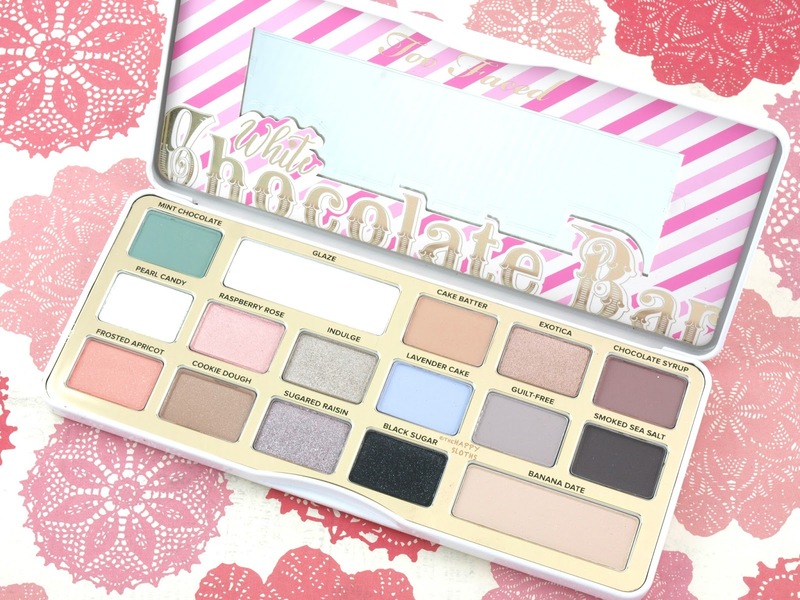 You get a total of 16 shades, weighing around 16g. There is a large mirror inside the palette and the box comes with a little booklet of simple tutorials on how to combine the different colors inside the palette. 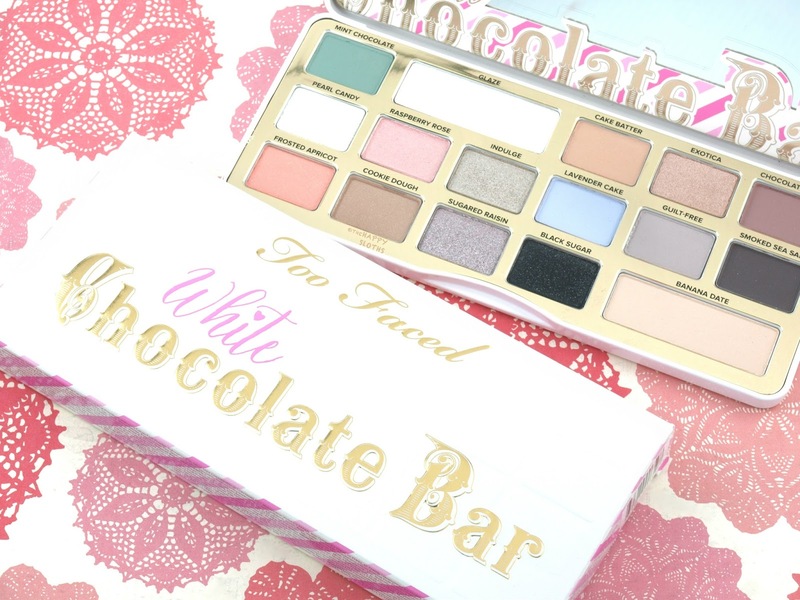 Since this is the White Chocolate Bar Palette, the overall color scheme is quite pastel and soft. You get a balanced mix of mattes and shimmers and there is a good combination of neutral and brighter shades. In terms of formulation, the palette is a mixed bag. 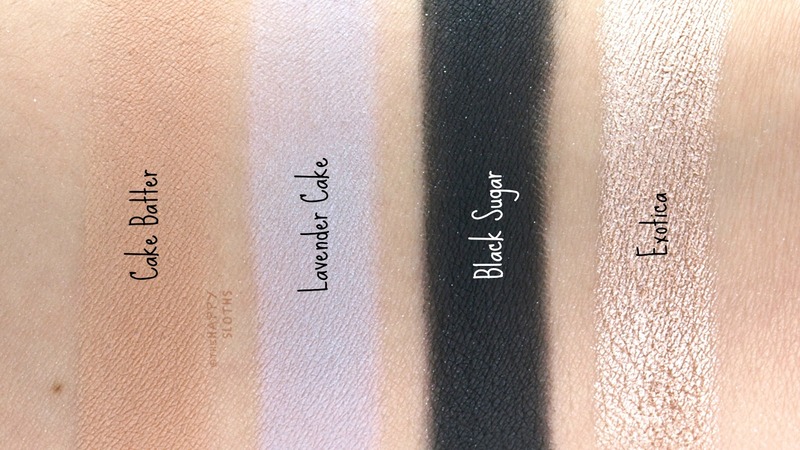 The texture of the shadows aren't chalky or dry but they certainly aren't the buttery, creamy ones that I've come to expect from Too Faced. 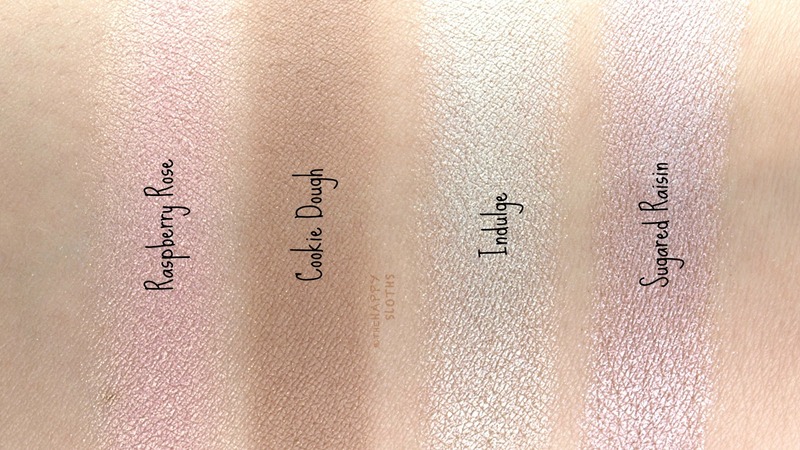 Although soft in color, most of the shades are nicely pigmented but a few don't build very well. 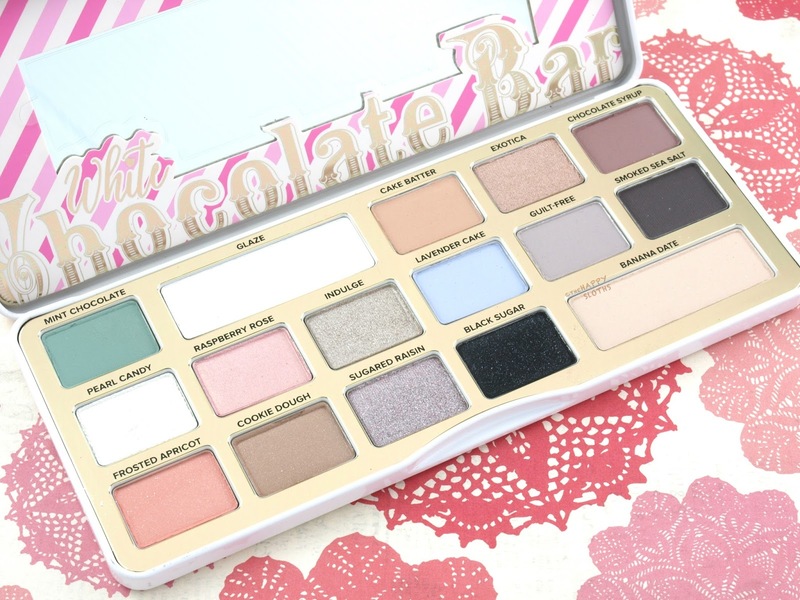 Read on below for a detailed breakdown of all 16 shades. Mint Chocolate: A light seafoam green, Mint Chocolate doesn't feel super creamy or silky upon swatching but it is very nicely pigmented. 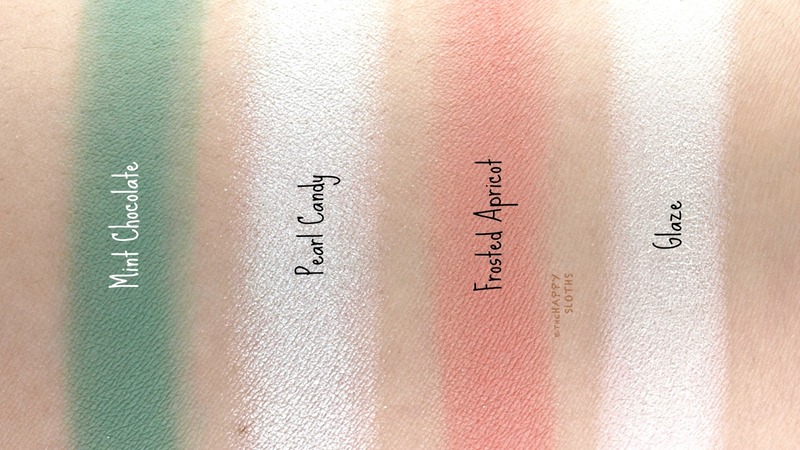 Pearl Candy: A sparkly white shimmer, Pearl Candy is very messy and prone to fallouts. Frosted Apricot: This is a soft dusty peach with a subtle sprinkle of fine silver shimmers. Similar to Mint Chocolate, the formulation doesn't feel super creamy but it's nice and pigmented. Glaze: Perfect as a highlighter for the brow bone and the inner corners, Glaze is a soft matte white. The formulation is nice and pigmented. Raspberry Rose: This is a soft light pink with a subtle golden sheen. The formulation feels a little chunky and the pigmentation is on the sheerer side. Cookie Dough: A creamy soft brown, Cookie Dough has a subtle sprinkling of iridescent gold shimmers. The shadow is decently pigmented and silky to touch. Indulge: A light pewter shimmer, Indulge is soft and creamy. The pigmentation is decent but the shade wears best over a base color. Sugared Raisin: This is a dusty lavender version of Indulge. The formulation is also smooth and pigmented. Cake Batter: A soft beige brown, Cake Batter is creamy and pigmented. This is a great crease or transition shade. Lavender Cake: This is a matte pastel lavender. The formulation is nice and smooth but the color doesn't build very well and sheers out really easily. Black Sugar: A matte black dusted with sparse silver sparkles, Black Sugar is nicely pigmented but just a tad chalky. Exotica: Another shimmer similar to Indulge and Sugared Raisin, this is a rose gold shimmer. The pigmentation is really good and the finish has a gorgeous sheen. Guilt-Free: This is a matte elephant gray. The color is soft and silky. Like Lavender Cake, it's a little sheer and doesn't build very well so it's probably best used as a blending color. 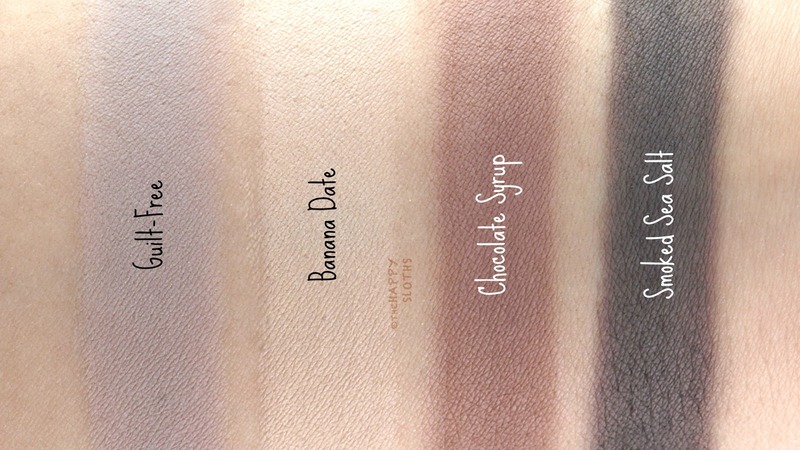 Banana Date: A pale matte vanilla, Banana Date is another great crease/transition color. The formulation is soft, creamy, and highly blendable. Chocolate Syrup: Another neutral matte, Chocolate Syrup is a soft milk chocolate. The pigmentation is decent and the color blends very nicely. Smoked Sea Salt: A deeper outer corner shade, Smoked Sea Salt is a cool-tone dusty brown. The formulation is pigmented and non-chalky. 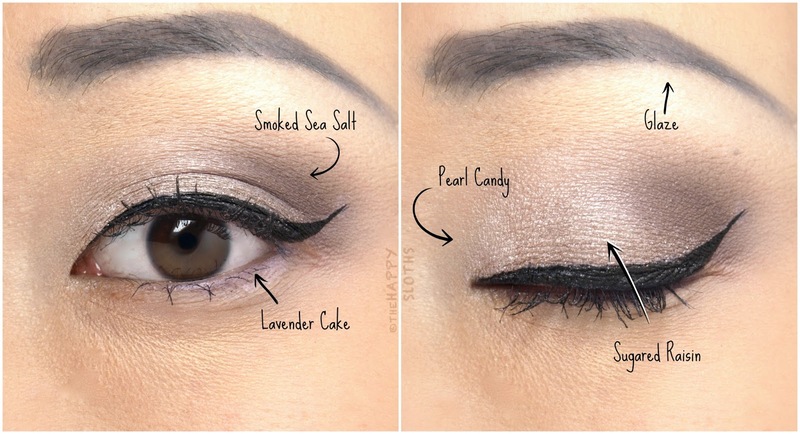 Below is a look I created using Glaze, Pearl Candy, Lavender Cake, Indulge (I made a mistake in labelling the image), and Smoked Sea Salt. I think overall this is a good palette although the color selection is a little challenging to work with. There's not a color I dislike but I find it difficult to incorporate the "brighter" pastel shades with the more neutral beiges and browns. I think for most people, this is not going to be an everyday, go-to palette. However, if you like the colors you see, then do give it a swatch in stores! Too Faced is available at Sephora and Too Faced.